When I wrapped my review of Tales from the Borderlands‘ first episode, I mentioned how I wanted episode 2 “like, yesterday.” So naturally it took more than three months to come out. Go figure. I’m happy to report the wait was mostly worth it. Zer0 Sum kicked the series off with a brilliant bang, bringing plenty of action and humor, and Atlas Mugged proved it wasn’t a one-off occurrence. Though the second episode didn’t feel as lengthy, it was every bit as awesome. At the risk of revealing minor spoilers, Atlas Mugged reunites players with a solid batch of pre-established characters including Scooter, Athena, and Springs, with Jack playing a much larger role this time thanks to episode 1’s finale. The mystery of his holographic presence is further deepened when it’s revealed that he himself is unaware of what’s going on. His memory seems unaffected by his death in Borderlands 2, but only Rhys can see or interact with him. Atlas Shrugged shows our quartet of Rhys, Vaughn, Fiona, and Sasha looking to learn more about the mysterious Gortys Project while still struggling to stay alive on the increasingly dangerous world of Pandora. It also shows Vaughn’s unexpected 6-pack, so that’s something to look forward to as well. 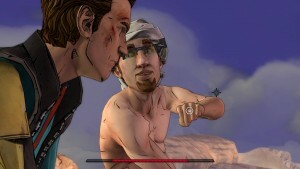 This moment holds perhaps the greatest selection of “what to say?” phrases Telltale Games has yet given us in any game. It’s seriously worth replaying just to choose all the options in that scene. All things considered, this round seems more focused on the laughs than anything. The plot presses ever onward, and tension is mounting as more and more assassins show up to murder the team, but at the end of it I was left wondering why it stopped where it did. The “cliffhanger” wasn’t nearly as edge-of-your-seat intriguing or intense as the end of episode 1, but I suppose you can’t just expect another “why the heck is Handsome Jack there? ?” moment every time. That said, comedy is an integral part of the Borderlands name, and you should expect to laugh any time you play a game in the franchise. The story-telling angle Telltale takes works wonders in Tales from the Borderlands, as you don’t have to wait for a new quest or plot point to get another good laugh. Since there’s always something happening, there’s almost always something to laugh about. You can be on the run from a hit-man (or hit-woman, as the case may be), walking in the desert, held up at gun-point or stumbling over a railing; there’s always a bit of slap-stick physical humor or a snarky comment or a clever note in the corner from Telltale to make you giggle. Interestingly enough, after flicking back through my screencaps from episode 1, I only recall seeing one or two of the NEXT TIME ON TALES FROM THE BORDERLANDS scenes popping up in episode 2. I’m not sure if that’s due to the choices I made or because they’re still coming up, but it’s an interesting point to note. If Atlas Mugged’s NEXT TIME scenes are anything to go by, I’m pretty pumped to see how Brick’s doing in episode 3, Catch-a-Ride. Hopefully we won’t have to wait another quarter of a year to play it. At the end of the day, you’ll have a good time with Atlas Mugged if you enjoyed Zer0 Sum. Even if you didn’t care for Zer0 Sum, you should still play Atlas Mugged so you can scoop a man’s eyeball out of his head with a spork and be the broiest bro, bro. It’s good times. Tales from the Borderlands is developed and published by Telltale Games, in association with Gearbox Software. Episodes 1 and 2 are currently available for PS3, PS4, Xbox 360, Xbox One, PC, iOS, and Android.